It is the simplest, yet most secured way to buy and sell both bitcoin and litecoin and make huge profit through price markup. You can buy or sell bitcoin and litecoin in any currency of your choice. You also decide the payment method. Over-the-Counter form of trade (OTC). That is, you trade with real people and not robots. So, there is no price manipulations. No bond! And there is no limit to bitcoin or litecoin deposit or withdrawal. You can deposit as low as 0.001 and start trading. Both clients and traders are protected by escrow integration on trade process for safe and smooth transaction. You get trade request alert via SMS. You can never miss a trade whether you are online or not. We ‘gat’ your back. Trading is absolutely free. We pick commission only on transactions that are successfully completed. No hidden fees. You have a chat box (with file upload enabled and email alert) to quickly interact with co-trader or client. What are you waiting for. 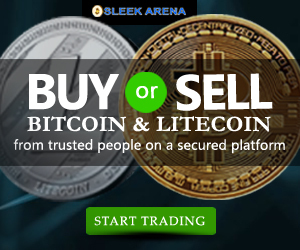 Start buying and selling both bitcoin and litecoin in your local currency on Sleekarena cryptocurrency trading platform.